When you think Puma, the first thought that comes to mind is style. For years Puma has cemented their name in the world of athletic footwear as a high-performance and stylish manufacturer. Their recent dabbling into the world of motorcycle boots is no different. The Puma Desmo boots, available in a brand new color scheme, remain true to Puma's trend of creating standout products. 100% developed in-house at Puma, the same R&D went into these boots as all of their other standout products. 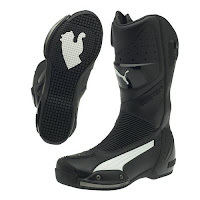 The Puma Desmo is a performance boot constructed to be versatile, durable, and stylish for the motorcycle rider who keeps it sport and street. The Desmo has impact protection features that compete with all high-end sport touring boots: internal nylon ankle cockpit; TPU shin, heel, forefoot, calf & toe protection; Zinc sliders on the toe and back of ankle; Flex inserts in the heel & forefoot; a rubber gear shifter; a comfort sock liner that is pre-molded and offers excellent vibration absorption; and finally, that superior Puma sole: high density and built for stability, grip and oil/abrasion resistance. Whew. That was a lot on the feature set. But these boots are really impressing us. 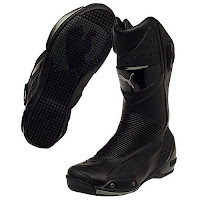 If you're a rider who focuses mostly on the sport road riding aspect of the motorcycle world, these boots are worth a good hard look. 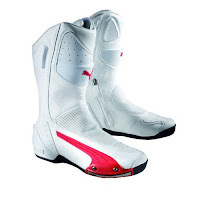 They go head-to-head with any of the high end road riding boots we carry at RevZilla. And they surely aren't going to stay on the shelves for long, so take a look before they're all gone!